So what exactly is a Rebuilt Book? A Rebuilt Book is what occurs when an author like myself meets the organizer of an annual city-wide literary festival like Amy Guth, and she tells me: "take your book apart and make it into something else." Anything is a big word. So last year at Pilcrow, Amy and Leah managed to raise something like $2,000 to assist the rebuilding of the New Orleans public library system. This year, they're sponsoring the Young Chicago Authors with the proceeds from auctioning off the Rebuilt Books this Saturday. So I was at a loss for a bit about how I wanted to disassemble Red Ivy Afternoon. What could I do that would jump out at people and still convey the story within? With the help of my editor Paul Hughes and (special thanks to) his good friend Adam Schrader, we hatched a plot to "take apart" my book. With guns. The base is a small photo box that is actually featured on the cover of the book itself as part of the jacket image. For a little kick, the label says "property of Dr. Pyndan Calabas." On top of it sits the blasted book and the cartridges that did the deed, echoing the bullets leaned up against the barcode box on the back cover. Suddenly, my idea was taking shape: a 3-D version of the book cover image, with some dramatic flair. I took a nice long drive into suburbia to Morton Grove to find a Michael's Crafts store that would have silk floral craft material, hoping they'd have red ivy. They did, but the leaves were comically too large, so I settled on the smaller-leaf green ivy with the idea I might dye or paint them. When I got home, I realized that the bottle of Testor's model enamel I bought was just about the same color as fresh blood. Suddenly, it all came together. I'd make the book bleed. Bleed on the cover and bleed on the ivy, a third and unforeseen metaphor for "red". In an afternoon, carefully and using an old syringe to strategically set the "blood" drops, I had a book that looked as though it had been shot by a firing squad. I hot-glued the thing together and left it to dry overnight. I'm very happy with the final product. 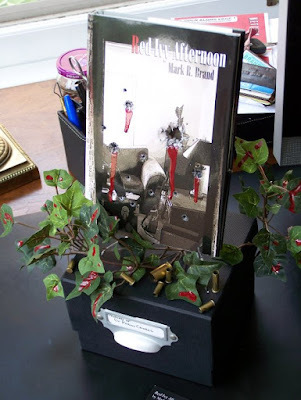 So, if you're in Chicago and you're interested in putting in a bid on the 3-D version of Red Ivy Afternoon, stop in to the Viaduct Theater or Trader Todd's and check out all the Rebuilt Books!